insane in the membrane, i just completed 11.15 Km run! this is my second successful attempt at running a 10K. who am i? what just happened? i remember two years ago, when this fad began, when i was running around AOLP, i could barely do 5K. i would talk myself out of doing the excersie knowing that it would be difficult. i ran once with the Running Room, and i was hooked. however, i haven't been back, since their group runs are Wednesday nights - i have meetings, often, and of course, Sunday mornings - i'm already booked. i started using their philosophy and it became my philosophy. i even read the magazines and have a stupid looking hat for my head in the wintertime. i always wondered why those runners wore those, or did that. and now, i know. i don't think this is a fad anymore. i've been training (coffee, ice cream, Sacraments, friendships, life, etc...) for over a month now, preparing for today (week four, hardest run). i feel good, and plan to do a light run tomorrow. so, that's it. good times. great times! this also helped me cross off another goal of mine: the 30min 5K. oh, and why George + his wallet? that's how i felt today while running! you see, i still don't have an armband to carry my new uber cool phone - in fact, no one makes them yet, the phone is too new and too big to fit anything else. i might as well carry my backsack and throw in my Dell desktop computer in it, the one i bought in 1832! oh well, since it was cold out today (+4C), i wore a coat, which conveniently has a pocket made for my phone. in the meantime, if you have any other ideas on how i can run with my phone as the temperature warms up, please let me know! peace (my muscles are screaming for it)! ps. how about a new wallet? 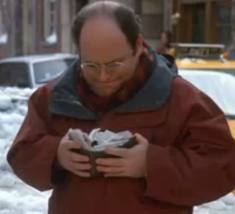 by the way, the picture is of George struggling to close his wallet, difficult because of everything that is in there! We are soooo proud of you JSB! Way to go. I think u need to start doing some hills in preparation for that half-marathon. You can do it!!! Thanks. Indeed i read something about hills last week. I might try that next week. You are a Seinfield fan?? Do you have a favourite character? I have a hard time choosing between Kramer, George or George's dad. I love that show and still haven't got sick of watching the repeats yet. Good luck with the running! wow, mabye i should check my comments more often! indeed, i love that show - still try to catch one or two episodes a week. i like the Fab Four, indeed. however, Newman is pretty high up there for me too.